After taking one load (aka truck bed full) of brick and other kitchen debris to the dump and coming back $48 lighter, Mark decided that rather than literally throw our money in give our money to the dump, we could just “bury” the rest of the kitchen demo debris under the subfloor between the footers. 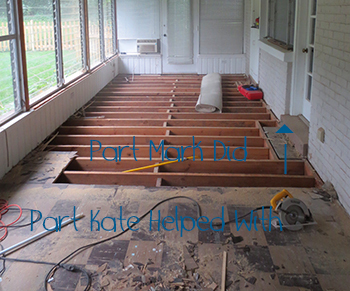 That means, of course, that it was time for the rest of the floor to come up. 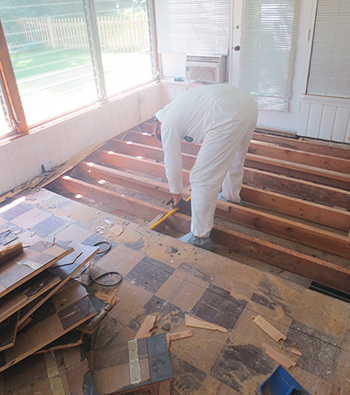 We had already removed the not-nailed-down-at-all carpet. To reveal this stunning tile job that Bruddah is showing off here. Given that we know that these tiles were installed either in the 1960’s or 70’s makes us pretty confident that they likely have asbestos in them. 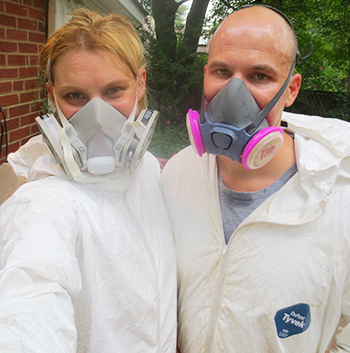 *Yay* Asbestos is not good times for sure, but we decided, after some research, that if we worked quickly and wore protective garments and masks, we would most likely not get mesothelioma. #notgettingcancerforthewin. 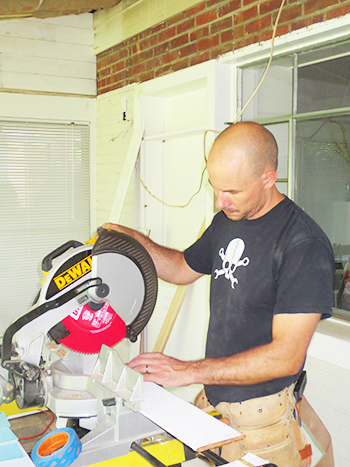 In order to remove the tiles, Mark would take his saw and cut the tiles between the footers to make a narrow row. Then he would use a crow bar to pry the tiles up from the footers. It was not easy work. 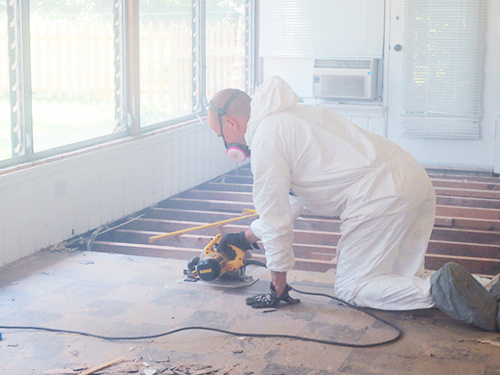 The tiles were heavily nailed to the footers, it was hot (like 95 degrees hot), and he was wearing a mask and tyvek suit. When he was done, he literally dumped sweat out of his mask. Sorry if that’s TMI. 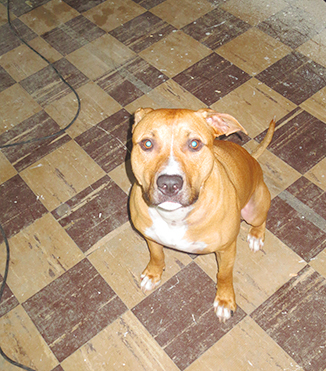 He was about 3/4 of the way done when I took pity on him and helped pull and remove the last 1/4. When we were finally done the floor looked like this. And we looked like this. Not a pretty picture. This was tough work you guys. Mark is my hero for doing so much of it himself. This is the type of glamorous, semi-dangerous, work that those DIY shows never tell you about. And the fun is not over. 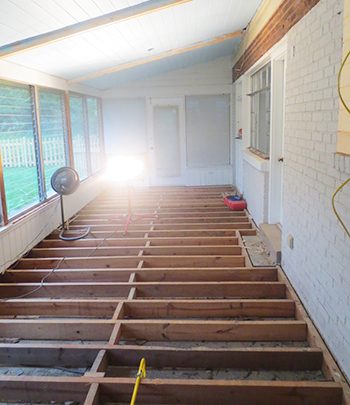 We still have to demo the rest of that kitchen before we can move on shoring up the footers and laying the subfloor. Here’s some good news though, our new windows are in! We will be picking them up later this week and I will have a whole post on the process of picking out and getting a good deal on new windows. You know you want to hear all about it. It’s a real nail biter! We are in the dog days of summer here in the mid Atlantic. The stifling summer heat and humidity has arrived and our motivation to move forward with demo seems to have left with the last dash of cool air. Additionally, we’ve had some pretty fun social plans recently that we just couldn’t pass up. More on those below. 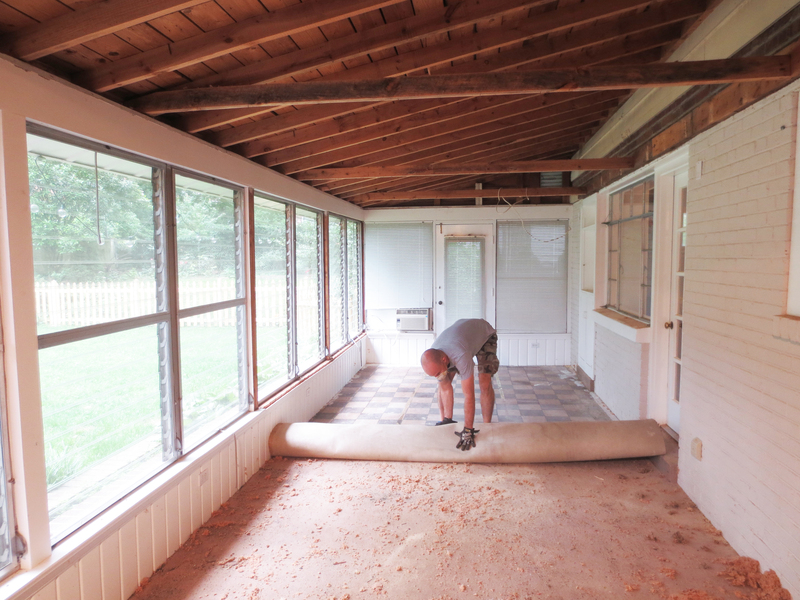 After we finished painting the sun room ceiling, we started to demolish this guy. This is the outdoor kitchen that we think may be original to the house. Obviously, it was there before the sun room as it is a outdoor kitchen and it’s clear that the flooring under and around it is not the same as the rest of the room. It boasts some interesting “features.” Come with me in the way, way back machine and I will show you. This is the “command center” for the two electric burners that our home inspector said work, but we probably shouldn’t use. Uh yeah. Here are the two said electric burners. The electric power for these actually comes from the wall to the kitchen. I have no idea why there are two holes in the brick and I really don’t know how these two ovens? BBQs? worked, but here’s a close up of he middle cooking vessels. When you open them now, it’s just an empty hole to the floor, so again no idea. 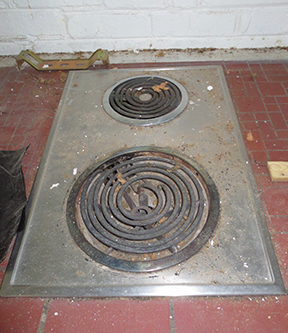 We’re pretty sure that this little set up was that cat’s pajamas in 1948 or whenever it was built, but it’s not exactly what people think of when you say “outdoor kitchen” today. Not to mention it’s no longer outdoors. *Ahem. 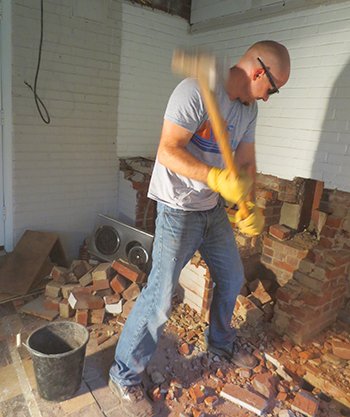 So we said our good byes and Mark got out the sledge hammer and crow bar. We’ve made some progress, but not as much as we’d like. 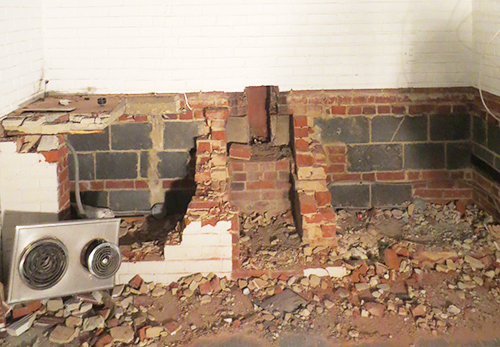 The brick is really hard to work loose, so it’s slow going in terms of getting it into small pieces. Here’s what it has looked like for about a week now. You can also see in this picture what I meant about the “ovens”, the empty middle area between the two columns of bricks is where they were. Talk about doors to nowhere. The reason we haven’t made more progress is pretty much two-fold. One, Mark has had to tend to some no longer can be ignored yard duty. It has rained so much here this spring and summer that finding a time to mow can be a challenge. Plus the side of our yard is so wet that mold and mildew are starting to set it. Mark literally had to scrub the brick sidewalk with bleach and a wire brush, I can’t imagine that was awesometown in the summer heat. 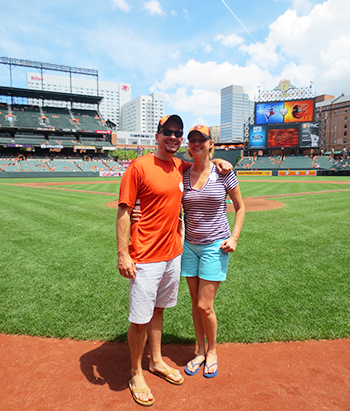 We were guests of my brother-in-law who was a guest of the Orioles thanks to the Yellow Ribbon Fund. We were allowed on the field before the game to meet a few players and take pictures. We sat in a suite, which was so nice on the super hot day, and we were even treated to a home town win! We don’t have as much going on this weekend and the temperatures are supposed to cool off a bit so hopefully we’ll make more progress on our outdoor kitchen demo and have some updates for ya next week. Until then, stay cool! 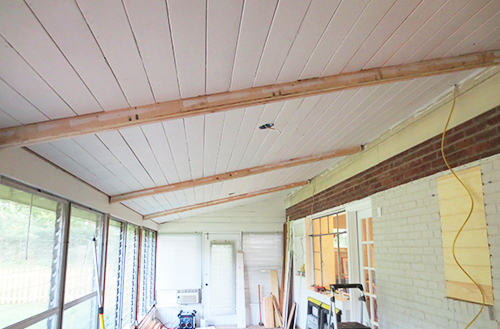 When we last left our new sun room ceiling she was a looking like this. So we got out this stuff. 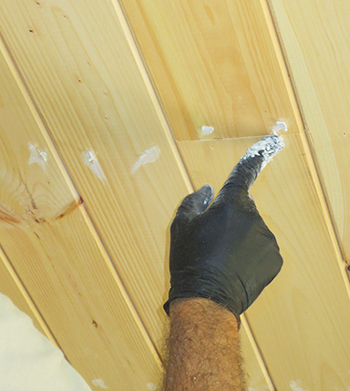 Put on our latex gloves and started to fill each and every nail hole with a bit of the putty. In an effort to not have to go back and sand the entire ceiling because sanding something that’s above you might as well be water boarding, we used a putty knife to scrape off the excess putty as we went. 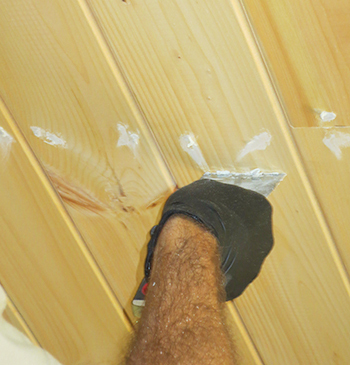 Here’s Mark filling the holes with the putty. 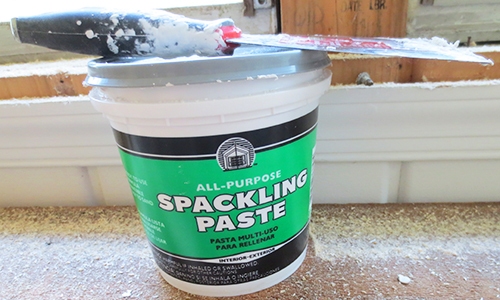 And then scraping away the excess spackling to create a smooth surface. It took us about two hours working together to get all the holes filled. Here’s a shot a one row of nail holes once they were done. Since we weren’t using it indoors or around kids/pets/pregnant people, I wasn’t overly concerned with fumes. I’m fairly confident my 1948 house is full of worse things than primer. I really didn’t want to have to do more than one coat and as I mentioned before, the old boards were pretty badly stained. I was worried that the water based stuff might not cover as well. Cost. The old school stuff is about $3 a gallon less. 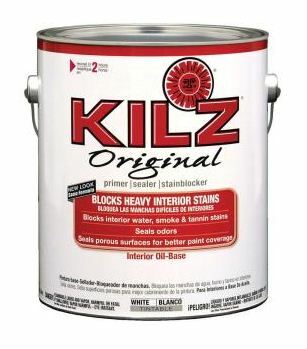 I chose Kilz Original Primer, Sealer, and Stainblocker. There’s no pictures of the priming process because I was afraid I would get primer on the camera. Since it’s oil based primer, you can’t wash it off with water. 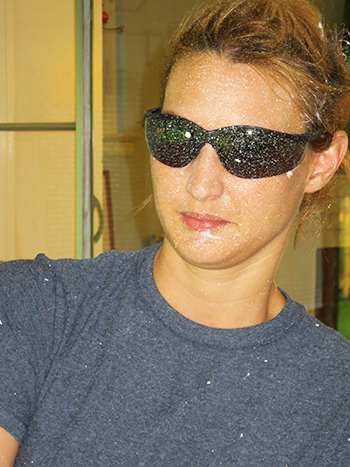 You need mineral spirits or some other paint stripper. It was a messy, but not terribly difficult job. We bought an extension roller so that you wouldn’t need to use a ladder for most of it. And since I was just looking to get some general coverage and stain blocking, I didn’t edge any of the corners or creases, so it was just rolling straight across the ceiling. Here’s what it looked like when I was finished. And here’s what I looked like. I think the ceiling may have won this round. But the good news is the primer did a great job of covering the stained boards and everything looked great and ready for paint. I did need to edge the corners and creases between boards on this step, so I started with by doing that and then rolled over it. I did this in stages so I would edge and trim between two of the beams, then roll that section, before moving to the next. I did two sections by myself and then Mark helped with the last three. It went alot faster with me edging and Mark rolling. When we finished, we sat back and admired our work. We love the color. It’s not too dark or too light, too green, or too grey, or too blue. It looks great from inside the rest of the house. We’re smitten. The other good news is that it only took one coat. So we’re pretty much done with the ceiling for the time being. Much to the cheers of our neck, back, and shoulders. 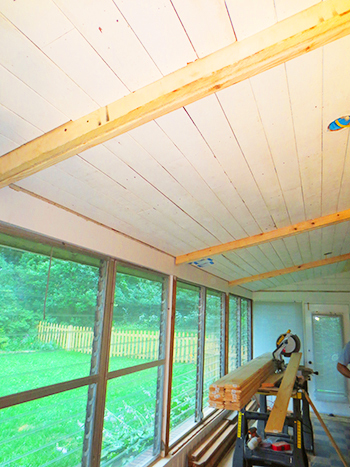 We still need to trim out the beams and paint those white, but we will wait on that for now. 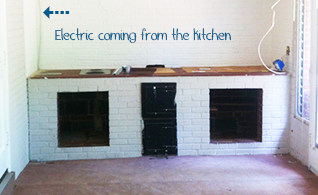 So now we are onto the floor and the brick counter/kitchen. These look to be big jobs in terms of demo so we’ll see how far we get this week/weekend. You know we’ll let you know how it goes! For me this best part about this sun room reno is it that, for the first time, I am getting to decorate a room completely from scratch. So for awhile now I have been thinking about how I want the room to look and feel. Being a California/Hawaii girl, I’m not used to sun rooms. What I am familiar with are beautiful patios/lanais that feel like rooms even though they are entirely outdoors, like these. 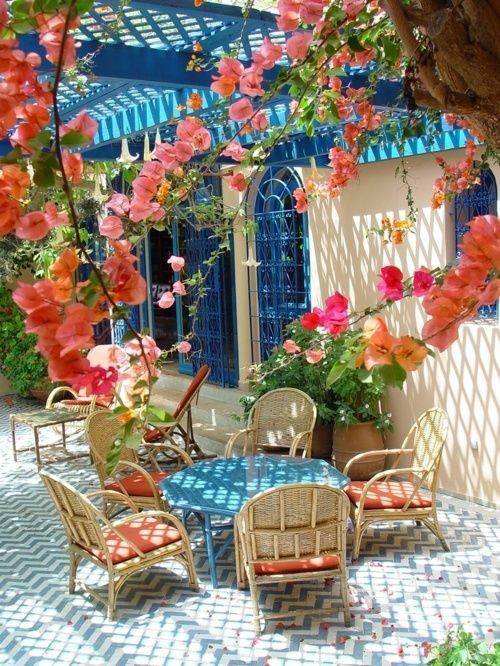 So my goal is to make the sun room feel like a one of these backyard patios, except with walls around it. 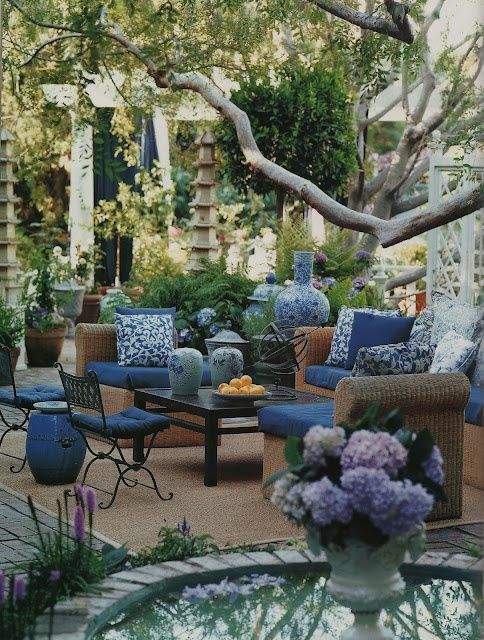 And while I want to draw on the inspiration of west coast/hawaiian outdoor spaces, I don’t want the room to feel out of place in my east coast cape cod, so I want to make sure I am incorporating regional styles and trends. Lastly, I want the room to feel like a natural extension of the rest of the house and not like an add-on, which is what it has felt like until now. So that’s a little background on where I’m coming from as I start to talk about paint choices. 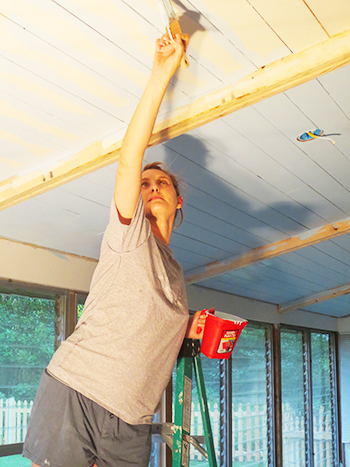 The first decision to be made paint-wise is the ceiling color. 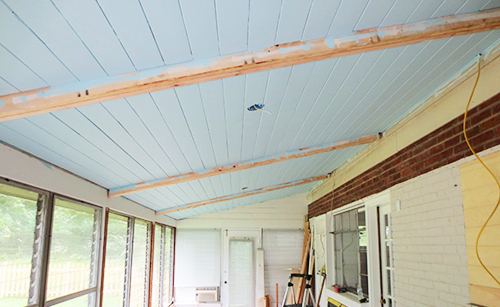 I have learned that in the south and mid-atlantic, blue ceilings are a popular choice for sun rooms and screened-in porches. Some say they help keep bugs away. I like the idea not only because it is a local trend, but also because blue = sky and I thought it would help give the room that patio feel I am going for. Luckily, Mark agreed with this logic, so blue ceiling it is! But as I mentioned before, blue is hard man! 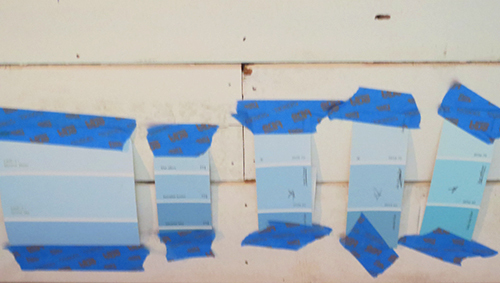 I’ve made many a blue paint mistake in the past so this time I wanted to be extra careful and take my time choosing what I hope will be just the right tint for the ceiling. We started with lots of paint chips. And narrowed it down to the colors we liked in three not-at-all scientific catagories; grey blues, blue blues, and green blues. Then we taped our favorites to the wall and thought about it. We pretty much eliminated the grey blues because we thought they were a bit too dull. We wanted it to feel like the sky on a bright spring or summer day not a cold, grey winter day, so we eliminated the grey blues and then further narrowed it down to these three contenders. Pretty much across the board, every color we considered was from the second chip on the strip. We felt that the top chip was too light and anything below the second was too dark. 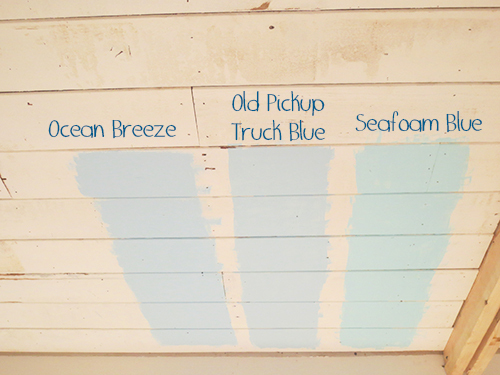 The names of the three selected chips above are (from left to right) Ocean Breeze, Old Pickup Blue, and Blue Seafoam. They are all from Benjamin Moore’s Color Preview line and they are pretty similar. The chips numbers are 2058, 2054, and 2056 respectively. Ocean Breeze is the most true blue and Blue Seafoam is the most green blue, with Old Pickup Blue falling somewhere in the middle. 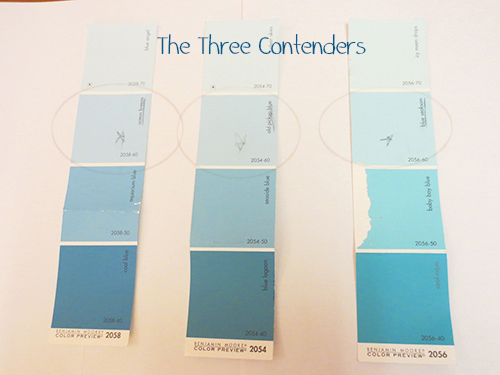 We grabbed samples at Home Depot and painted swatches of each on the sun room ceiling. What do you think? We had several people over on the Fourth and everyone seemed to think that the middle swatch (Old Pickup Blue) was our Goldilocks color; not too green, not too blue, but juuuust right. And you know what? We totally agreed! In the photo above it doesn’t look all the green but here’s a look at the full chip of colors in the family. If you look at the darker colors on the chip, there’s definitely alot of green them. 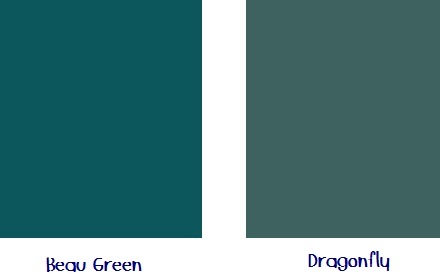 In fact, “Beau Green” looks alot like “Dragonfly” which is the color of our bookshelves. We think it will tie in nicely and that’s important since you can see the ceiling of the sun room when you’re sitting in the living room. 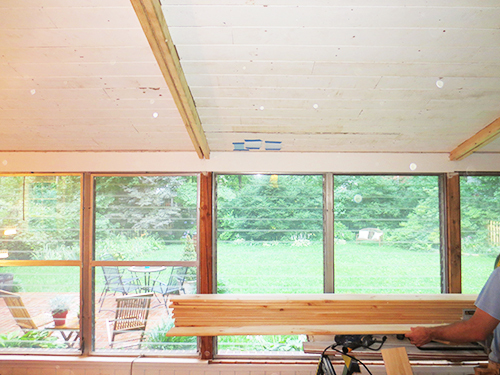 The bookshelves are on the sun room’s wall so I think it will help bring out the green in the ceiling color. Since we also have a light blue on the living/dining room walls, (BM’s Constellation if you’re curious) I am hopeful they the three blues look cohesive and don’t compete with one another. So that’s where we are. Starting a new and hopefully long-term relationship with an Old Pickup Truck. We’ve got some prep work still to do before we can get to painting, but we are still aiming to be done by the end of the weekend. What do you think? Did we make the right call? Would you have preferred a different shade? Or are you staying out of it because blues scare you too? We’ve almost got the ceiling up. And it’s looking awesome. Ok, it’s not really looking all that awesome yet. But you can tell that it’s going to look awesome. That’s basically the same thing, right? 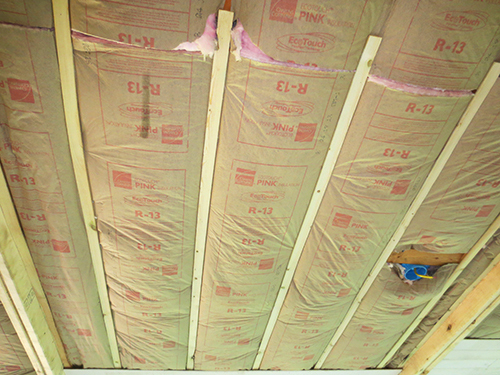 After we finished installing all the insulation, we added wood shims between the rows so that the old ceiling panels would be be the same thickness as the new ones..
After we got this done, it was time to start putting the ceiling panels back up. 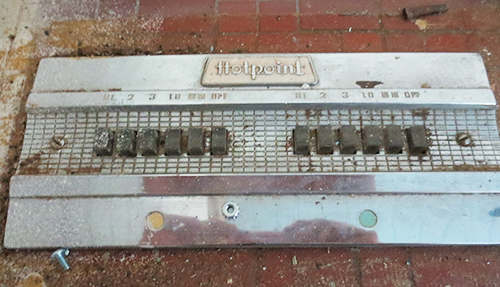 We wanted to re-use as many of the original panels as we could so we removed all the nails from the boards and if they didn’t split too much when we were taking them down, they were placed in the “re-use” pile. Before we could put them back up, we needed to give them a light sanding so that they would take primer and paint and therefore, look new once we were finished. 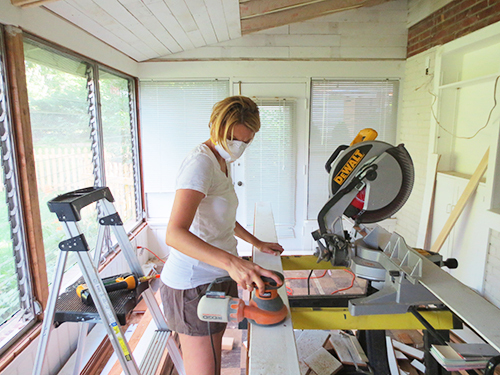 Here I am sanding some of the boards. 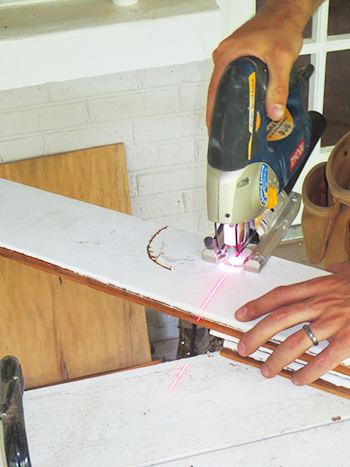 Mark did alot of the sanding himself, but when I had time, I would sand and he would measure and cut the boards, then nail them to the ceiling. 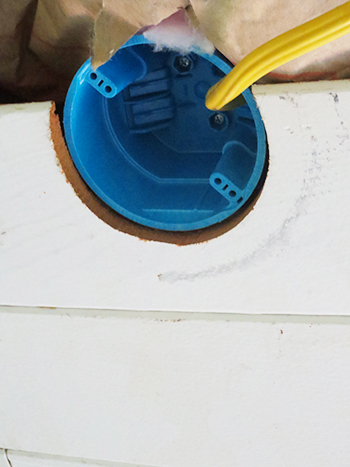 When it came time to install a board where an electrical junction was, he used a jigsaw to cut out the wood around the junction box. 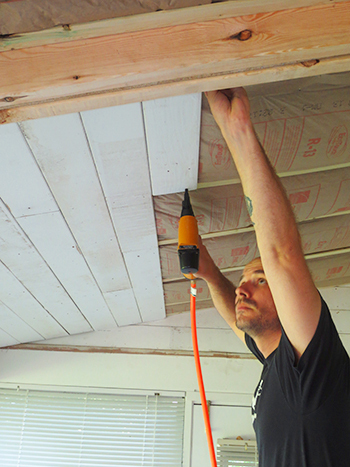 We didn’t have enough old wood boards to completely finish the ceiling because some split when we took them down and we cut them to different lengths so there was some scrap waste, but I’d say we were able to cover about 3/4 of the ceiling with what we had. Here’s how it looked about half way through. 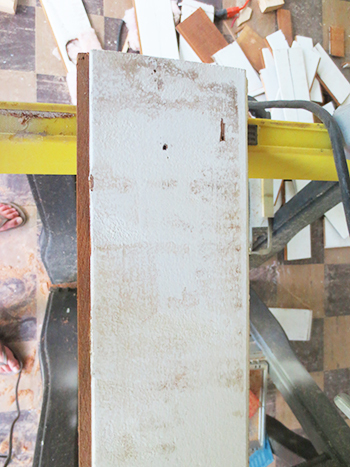 What we didn’t realize until we got the ceiling panels back up is how dirty they were. 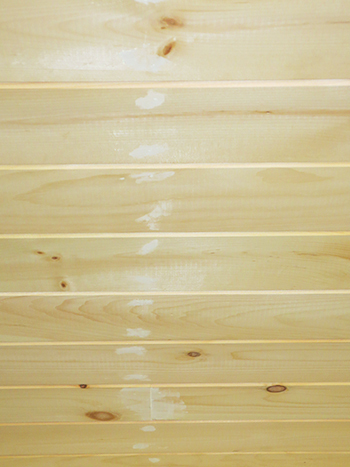 Even after a good sanding, the boards looked like this up close. 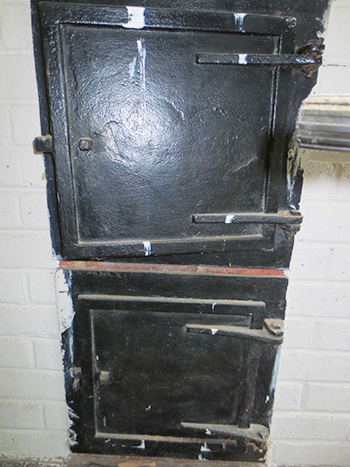 Given this, we think a good coat of primer is definitely in store before we paint. And speaking of paint, we have started to think about the color as we’ll be painting the ceiling before we start tackling the floor. That way we don’t have to worry about drips which is especially nice when painting overheard. 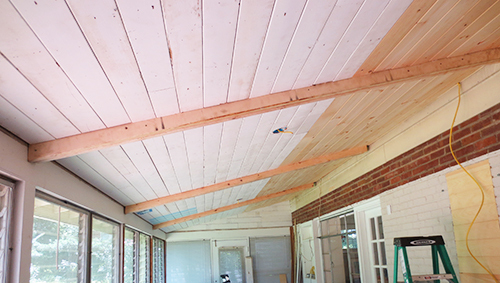 Here’s a little sneak preview of the ceiling that’s completed with a few paint samples already taped to the boards. I will be back later this week with a full post about ceiling color. As you can see, we are thinking about a light blue and man are there alot of choices. Is it just me or is blue a hard color to get right? Happy Fourth of July everyone. Don’t go too crazy with the firecrackers.